Creamy Fruit and Nut Couscous Paneer Pudding with Chocolate is rich, creamy with a classic texture. This pudding has some similarity to Indian rice pudding, aka ‘Kheer’, but this recipe is with some new ingredients. 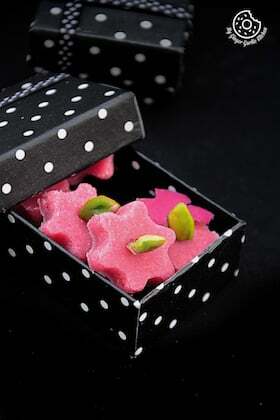 It is perfectly sweet, and very delicately flavored with cardamom, saffron and rosewater. And at the end, it is finally topped with coconut shavings, raisins, almonds, cardamom, chopped mangoes, grapes and dark chocolate. This is what I call a feeling of true heaven in a glass. Uuuummmm, this flavoring is indeed very good for any pudding on planet Earth. Happy first Friday of August, guys! Today I am here with a Friday fiesta for you all! Well, for me it’s a pudding Friday, because I am going to eat lots and lots of pudding which I made yesterday. Yes, I made some gorgeous, delicious, droolicious pudding for my family last night. It’s very exciting. ‘Hip Hip Hooray’ to that! If you ask me about this ‘Creamy Fruit And Nut Couscous Paneer Pudding with Chocolate’, I will probably say “I don’t have enough words to describe that heavenly feeling to have my mouthful with this divine dessert”. Oh, just thinking about it melting on my tongue makes my heart dance. And what about the taste, there aren’t any words who can do justice to this pudding. Really, this pudding is so damn delicious. Plus, this is a versatile pudding. This is because this pudding can be eaten at any time of the year for any meal. Let me tell ya. You can have this for breakfast. You can have this for dessert. You can have this for brunch. You can have it for late night snack. If you are having this pudding on a warm day you can have it chilled. If you want to have it in on a cooler day, you can have it warm. Did you see, how this versatile pudding works wonderfully well for every meal on any day of the year? And there are plenty of other reasons why people tell this pudding can be eaten ANYTIME. So tell me, what idea comes to your mind when you get some milk, couscous, paneer, and chocolate? I make pudding with the remaining ingredients. This is what I usually do with these ingredients! If you read my posts, then you already know that chocolate is my weakness. So I *HAVE* to eat it up. But at least this time I disciplined myself and saved some chocolate for the topping of this pudding. Ufff! That was really hard for me though. But I did it. What motivated me to keep some chocolate? I thought if I add chocolate to the pudding, it would look very pretty and delicious. And addition of the chocolate to this light pudding would convert it into a superior dessert. Do you want to eat a dessert for breakfast and not feel guilty about it? Here is the solution. This Creamy Fruit And Nut Couscous Paneer Pudding with Chocolate is a perfect guilt free dessert. 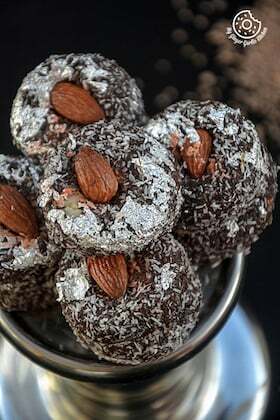 And sometimes we all love to eat a guilt free dessert, ain’t’ we? OMG! Eating a dessert for any meal is kinda fun. I am very sure that most of you will be familiar with rice pudding. This pudding has some similarity to Indian rice pudding, aka ‘Kheer’, but this recipe is with some new ingredients. Basically, it has many new ingredients, and has a slightly different flavoring. That’s why the overall outcome is healthy and delicious. Let me give you a real life example of how how good this is. Take Ado for instance; she just loves this pudding. According to her, this has everything she loves. It has lots of nuts. It has her favourite fruits. This pudding tastes great and since it does not contain any rice, this is lower in calories. Now, who wouldn’t want that. Let me tell you some amazing features of this pudding. This pudding is rich, creamy with a classic texture. It is perfectly sweet, and very delicately flavored with cardamom, saffron and rosewater. Uuuummmm, this flavoring is indeed very good for any pudding on planet Earth. And at the end, it is finally topped with coconut shavings, raisins, almonds, cardamom, chopped mangoes, grapes and dark chocolate. OH my god! This is what I call a feeling of true heaven in a glass. Why I chose to make couscous pudding? Well, I was trying to make something healthy and delish. And we can’t deny the health benefits of couscous. This is a healthy grain which is packed with vitamins and minerals to support good health and nutrition. Plus, it also tastes great. That’s why I simply opted for this as the main ingredient for my pudding. The final word on this pudding — this pudding is just TOOTHSOME. Let’s learn to make Creamy Fruit And Nut Couscous Paneer Pudding with Chocolate! Wash couscous and soak in 2 cups of water for 10 minutes. Drain excess water from couscous and set aside. Heat milk in a heavy bottomed pan and bring it to a boil. Add couscous and boil on a medium-low heat till the couscous is soft. Add crumbled panner and cooke for about 7-8 minutes. Grind the Saffron with 1 tbsp of milk and add it to the Milk, and let it boil for 7-8 minutes. Keep stirring the pan and make sure it does not stick to the bottom. Add sugar, cardamom and cook on low heat for 6-8 minutes. Add raisins, almonds and cook on low heat for 2-3 minutes. Remove from heat, allow to cool a little. Drizzle rose water and mix well. Cover and place in the fridge for about 4 hours or overnight. The next morning, pour the pudding into 4 bowls or glasses. Top with chopped mangos, grapes, coconut shavings, crushed cardamom, almonds, raisins, and dark chocolate. Drizzle few drops of rosewater, if desired. 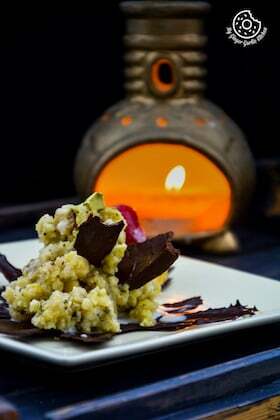 Creamy Fruit and Nut Couscous Paneer Pudding with Chocolate. Heat milk in a heavy bottomed pan and bring it to a boil. Add couscous and boil on a medium-low heat till the couscous is soft. Add crumbled paneer and cook for about 7-8 minutes. Grind the Saffron with 1 tbsp of milk and add it to the Milk, and let it boil for 7-8 minutes. Keep stirring the pan and make sure it does not stick to the bottom. Add sugar, cardamom and cook on low heat for 6-8 minutes. Add raisins, almonds and cook on low heat for 2-3 minutes. Remove from heat, allow to cool a little. Drizzle rose water and mix well. Cover and place in the fridge for about 4 hours or overnight. Pour the pudding into 4 bowls or glasses. Top with chopped mangos, grapes, coconut shavings, crushed cardamom, almonds, raisins, and dark chocolate. Drizzle few drops of rosewater, if desired.